The holidays are good excuse to eat cake. Personally, I will eat cake anytime anywhere, but for those of us that are a bit more health conscious, an actual reason or occasion maybe required to eat cake. Although fancy holiday flavors like ginger, pumpkin, and apple maybe the more obvious choice – sometimes you just want something rich and chocolaty to finish of that holiday meal. This mocha torte fits the bill. 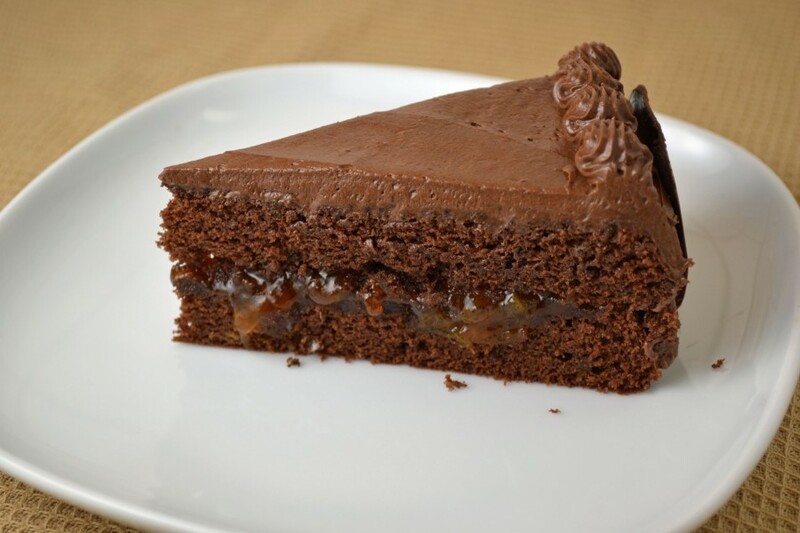 With a layer of apricot preserves, it resembles the famous Viennese Sacher Torte that my grandmother worked so hard to perfect later in her career. However, these cake layers are composed of Paula Peck’s famous genoise and then smothered with a velvety mocha buttercream that is so good it’s hard not to eat by spoonful. And unlike the Sacher Torte, which is finished with a chocolate glaze, this torte is garnished with semi-sweet chocolate discs that melt in your mouth. You may be thinking that this cake sounds like a lot of work. Afterall, making a cake can be somewhat of daunting task. There are, of course, ways to simplify the process. You can always skip the chocolate rounds and you can even skip the apricot preserves (the chocolate/fruit preserves combination tends to lack in popularity with younger generations these days). No need to worry about pastry bags or making a mess with a piping bag, the cake can simply be frosted with a spatula. The mocha buttercream with its hint of coffee that brings out the chocolate flavor in the moist cake, will speak for itself. Sprinkle cake layers with cognac, if using. Sandwich them together with apricot jam or preserves. Spread sides and top smoothly with buttercream, reserving some for decoration. 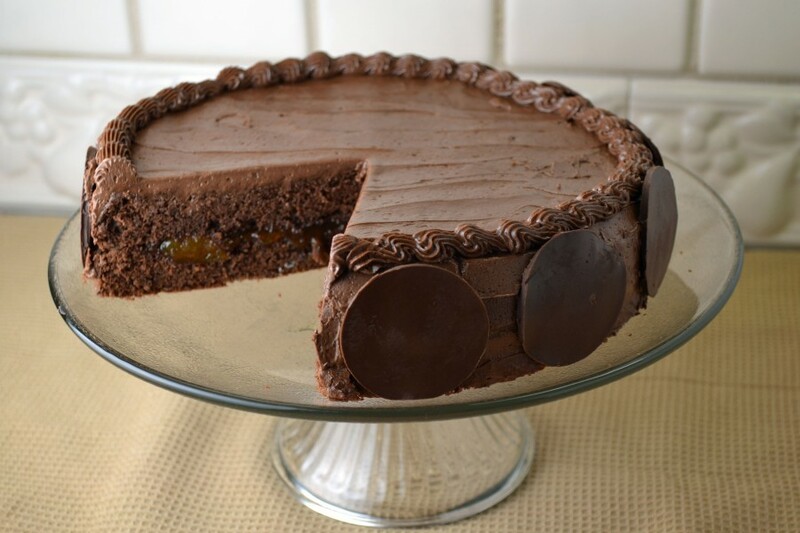 Arrange chocolate rounds next to each other flat against side of torte. Save 3 chocolate rounds to cut into quarters (optional). Set quarters flat in the butter cream around the top of the cake. Decorate the torte with remaining buttercream pressed through a medium star tube. Melt chocolate over hot water. Stir in shortening. Spread chocolate thinly on cooky sheet lined with wax paper or parchment paper. Chill in refrigerator or freezer for a few minutes or until chocolate just begins to set. Cut out rounds using a cookie cutter or the top of a water glass. Place back in refrigerator until chocolate is completely firm. Peel chocolate off paper. Looks and sounds fabulous, Megan! I love the chocolate rounds.